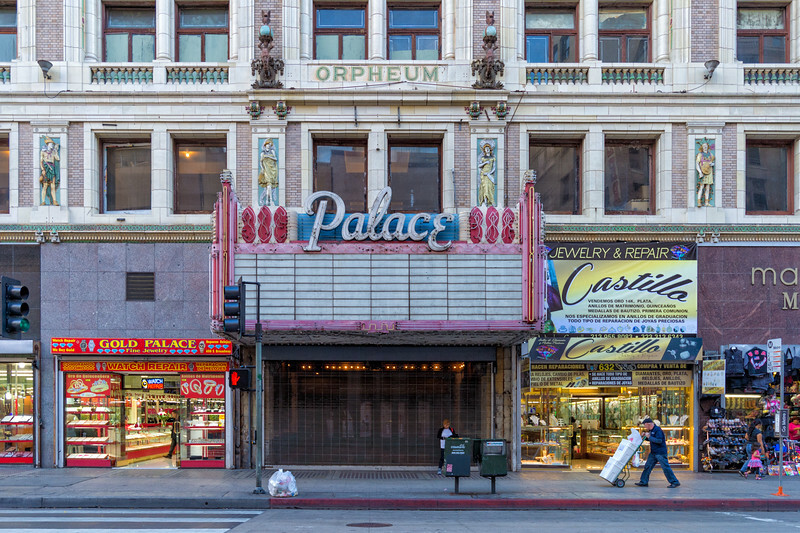 Two photos from a recent walk on Broadway in downtown Los Angeles. 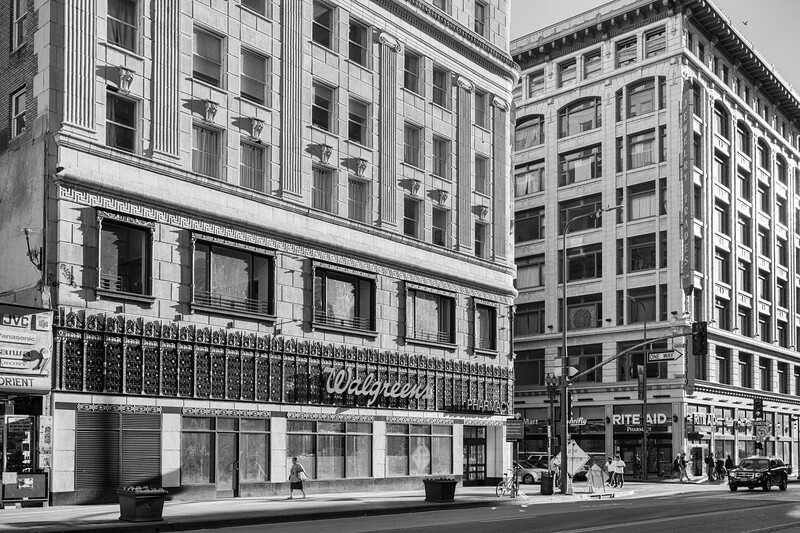 The street was once the epicenter of a thriving downtown L.A. but fell on hard times in recent decades although a revival of sorts is thankfully underway. The street has a bunch of old movie houses, some of which have been preserved or renovated and a few of which have been sadly divided into flea market type places. The Palace was rehabbed in 2011. I think I prefer the black and white versions of both the above photos. They feel old school. The color version of the Palace Theater is interesting, but the building is in the shade. 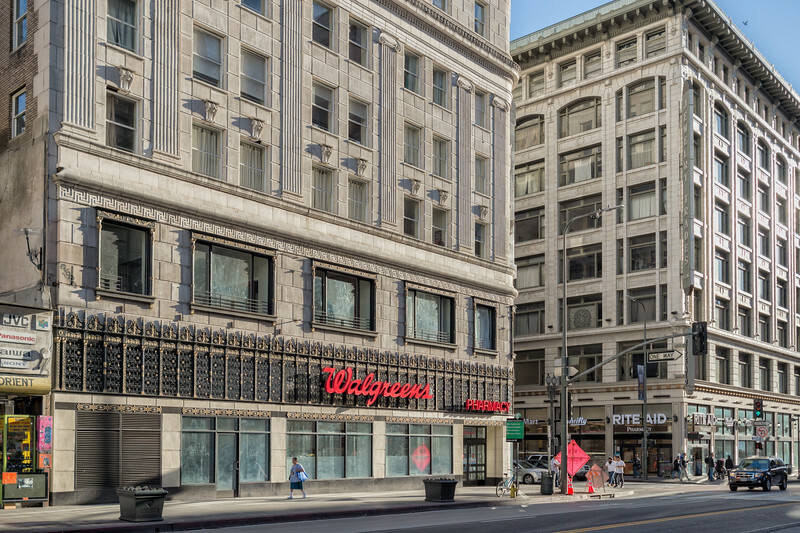 The color version of the Walgreens building feels too literal or digital or something. Both photos are helped enormously by the presence of people, albeit small people. The fact that there aren't many other people around tells a story -- this is a downtown with a lot of old buildings that's not exactly crowded (the photos were taken between 3 p.m. and 5 p.m. on a Friday afternoon) at times. And both people are striking action poses of sorts. The guy is pushing a cart, the woman is in mid-stride. Both give their respective pics a little oomph. Like these. Definitely have an old-school feel to them.